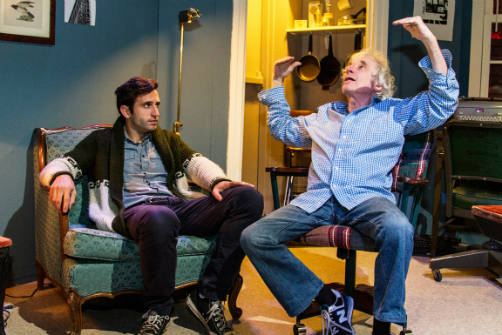 Sean Walsh and Austin Pendleton in Chinese Coffee. Photo by R. J. Caputo. BOTTOM LINE: Two friends have an intense all-night conversation which changes the course of their friendship and their future. On a cold winter night at 1:00am in '80s Greenwich Village, Jake Manheim (Austin Pendleton) frantically paces around his apartment. Occasionally he picks up a copy of Tolstoy’s Letters, not so much to read but as to distract himself of the inevitable arrival of his longtime friend Harry Levine (Sean Walsh). When Levin arrives demanding money owed to him by Manheim, what starts out as a quietly tense late-night confrontation spirals into a soul searching night which tests their friendship. Levine, a forty-four-year-old struggling writer who was recently fired from his job as a doorman in a French restaurant, is hard up for cash. Manheim, in his fifties, has only a jar of pennies and black coffee to offer him. After some unfinished business about a credit card loan Levine gave Manheim, the focus shifts to Levine’s manuscript, his latest novel based on their friendship. Levine asks Manheim for his criticism. What he gets instead is a lot more than he bargained for including some blunt truths about his talent and his life choices. Chinese Coffee is a great two-hander for actors, but not so great for the audience. While the performances by Austin Pendleton and Sean Walsh are impressive and entertaining, Ira Lewis’s script is rather long and redundant. Dialogue circles back and forth around the same conversations and themes as filler rather than progressing the narrative. As directed by Louise Lasser, who wisely knows the strengths of her actors, this production benefits tremendously from Pendleton and Walsh, who tug and pull at each other’s energy throughout. Subtle moments of quiet tenderness quickly explode into feverish argumentative monologues, and occasional humor is sprinkled in. Pendleton’s nervous energy only feeds Walsh’s penetrating calm gaze. Both actors exude a presence of New York that is quickly vanishing: a New York with a seedier Times Square instead of polished Disney, of graffiti-covered Subway cars instead of touch screen displays and Wi-Fi stations, of working class blue-collar Bronx and Brooklyn accents instead of transplants and trustfundarians. The set design by Alison Buatti is equally impressive for the intimate Roy Arias Stage II space, complimented by Jonathan Cottle’s subtle lighting design. Though the playing area is small, Lasser’s staging benefits from this, increasing the tension between both actors when they are at a distance from each other, such as when they are sitting opposite each other from a small table covered in pennies. But when the actors are close together, you can clearly see the bond between these two men as Manheim places his hands on Levine’s while explaining how he’s been hurt and why. If only Lewis’s script had been whittled down to the essentials, the play might feel more like more of a thrill rather than circumlocution.